With a stay at Inn of America - Palm Beach Gardens in Palm Beach Gardens, you'll be within a 10-minute drive of Rapids Water Park and Playmobil Fun Park. Featured amenities include a business center, a 24-hour front desk, and laundry facilities. Free self parking is available onsite. 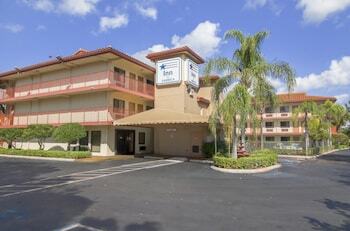 With a stay at Parkview Motor Lodge in West Palm Beach, you'll be a 5-minute drive from Palm Beach Zoo at Dreher Park and 10 minutes from CityPlace. Free self parking is available onsite.